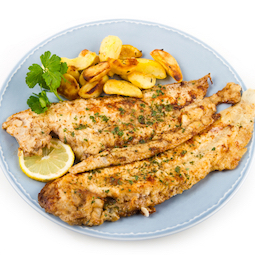 Dover sole is the exception to the rule that fresh is best. It does need to be two or three days old before you use it. Ask your fishmonger how old the fish is - he'll be able to tell you whether it needs to keep a day or two or is able to be used straight away. If you want them for a special occasion, such as a dinner party, then order them from him the week before, giving him the day you want to eat them - that way he'll know which day he needs to order them in for you. The Dovers are best served plainly grilled. 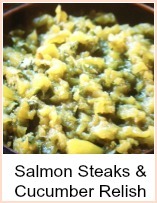 It is such a delicately flavoured fish, that it needs no fancy sauces to mask the taste. If you want to, then make some cauliflower cheese, fine green beans or asparagus instead of the salad - some excellent vegetables to go with this lovely fish. Use a pastry brush to baste the fish whilst it cooks - I've got one that I use only for basting fish so the bristles won't taint other foods. Preheat the grill and put the pan about 4 ins (10cm) from the heat. 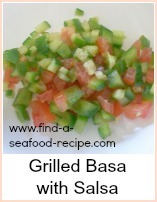 Brush the grill with oil and put the fish on it. 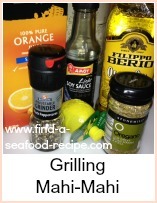 Brush the fish with oil and sprinkle lemon juice and pepper over. Cook 4 or 5 minutes on each side - baste with oil if necessary to prevent the fish drying out. Serve immediately with lemon wedges, new potatoes and a salad. This Grilled Dover Sole is a gorgeous recipe for a special occasion.